Large Popcorn, No Butter: Gone Girl: Woah. It's hard to make a movie that's as good as a book. Books rely on our imaginations and so it can be hard to see something on screen translated differently than the way you saw it in your mind. Such is not the case with Gone Girl. I can't remember the last time I saw a movie and thought "Wow, this is better than the book," but I found myself thinking that through this whole film. 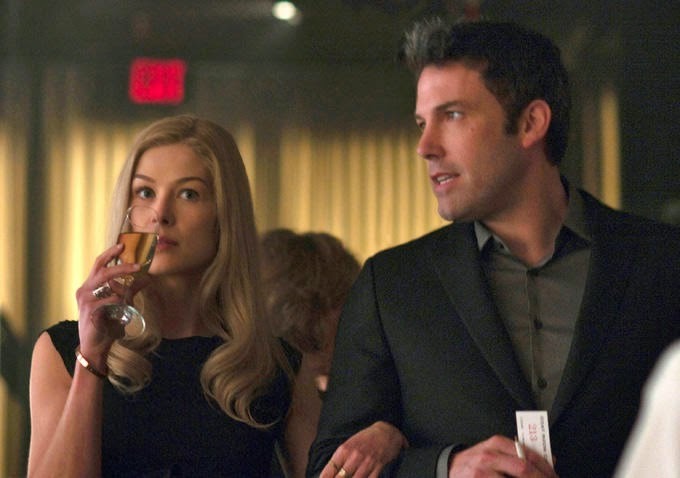 The plot centers around Amy Dunne and her husband, Nick. Amy has gone missing and Nick has no idea what has happened to her. As more and more evidence comes to light about the nature of their unraveling marriage, things are looking grim for Nick. Seemingly cold about the disappearance of his wife, he is not gaining any popularity. But as the plot unfolds, we begin to question whether maybe we're wrong about Nick's character after all. Maybe Amy's disappearance isn't what the public thinks it is. And maybe nothing is as it originally seemed after all. Prepare yourselves for some shocks and thrills, kids. The acting in this is insane. For a story that relies 1000% on character development, Affleck and Pike do not disappoint as the mesmerizing Nick and Amy. I've got to be honest: I don't usually like Ben Affleck. He's never struck me as a very poised actor before. Most of the roles that he plays are very average-Joe ish and I never really buy his emotions. That being said, Affleck is absolutely stellar in this role. For a character who you aren't sure whether to trust, Affleck is amazing. Seriously. We're talking Oscar-worthy. The same can be said of Rosamund Pike's portrayal of Amy. While I've only seen her in a few films, she's incredible in this. The way that she captures Amy's incredibly complex character is damn impressive. And that's not something I say lightly. I think I liked their screen counterparts better than the characters written on the page. 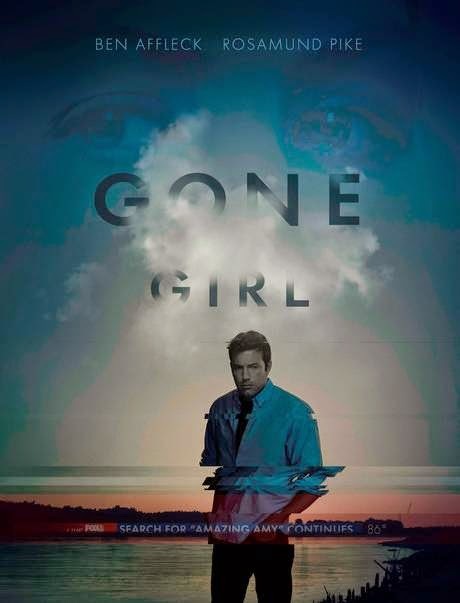 The other thing that I love about Gone Girl is its aesthetic, and really its feel in general. From cinematography to soundtrack to sets, this is an extremely well-polished piece of work. Crisp images of suburban normalcy pop out of the screen and fluctuate between the gray, well-decorated interiors of the Dunne house and the bright green-and-blue wilderness of the outside. There's something about the cinematography that makes you totally uneasy, as well. Flipping back and forth between the present reality of Amy's disappearance and her past journal entries (as happens in the book), things happening in the present seem too quiet set against their original, whirlwind romance. The soundtrack has that dichotomy too. Always sweeping, emotive songs, but with minor notes lurking underneath creating slight disharmony. Very well done, and very subtle. In terms of the actual story, I was shocked at how much remains unchanged in this movie adaptation. There were hardly any characters cut out of the script and next to no scene is cut out. Maybe (dare I say it) to its detriment. 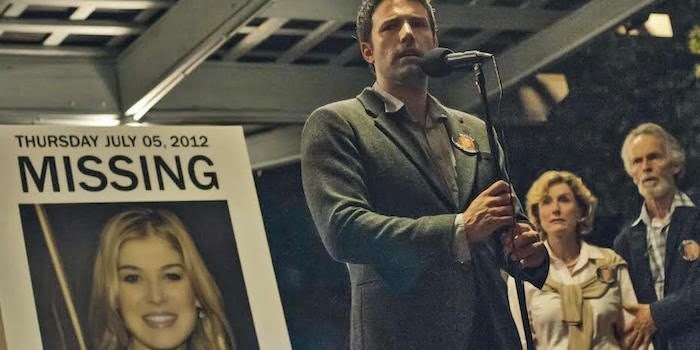 While allll of the tiny details of the book remain intact (and really, I mean, the structure of the story itself leaves little room for edits), the only bad thing i would have to say about Gone Girl is that it's long. Especially since I had read the book and knew how it was going to end, I spent the last 20 minutes of the movie tapping my foot waiting for the damn crash-bang conclusion. If you can hold out for the length of the movie, the climax towards the end is pretty damn crazy. But I wouldn't step into this theater running on less than 8 hours of sleep. Really excellently executed. I'd say 9 outa 10. Thanks! :) I could definitely see this getting Best Film and if both of them don't at least get nominated, they'll have been robbed. I also loved that YouTube link that you tweeted about Fincher's style, by the way. Dead-on. Loved it. Wonderful review, and I completely agree. I'm not the biggest Affleck fan either. I think he's a better director than an actor, but he was perfect as Nick. I couldn't imagine anyone else in that role. Good review Annie. It wasn't Fincher's best, but it was still so much fun that I hardly even cared.